Explore the different hiring styles and how they might impact your team’s performance. Our team had the pleasure of exhibiting at this year’s SHRM Talent Conference & Exposition. We were thrilled to have so many attendees visit our booth and enthusiastically take our hiring styles quiz. 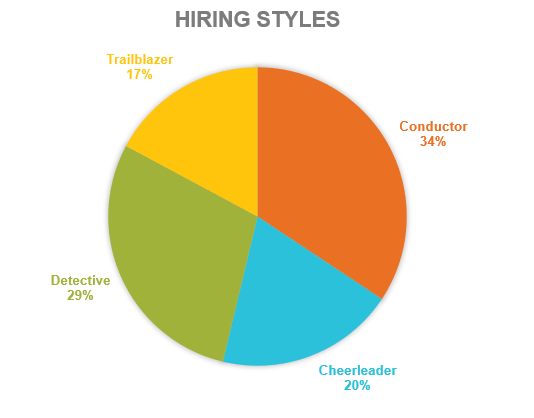 We saw a fairly even breakdown of hiring styles, with Conductor taking a slight lead at 34%. During the conference, we enjoyed hearing about how you fit your hiring style, or even how your co-workers seemed to fit a certain style. And a big thank you to everyone who brought their co-workers and friends to our booth so they could guess their hiring style as they were taking the quiz! It’s important to not only understand your hiring style, but also that of your colleagues, to help create a work environment that is cohesive and works for everyone. This is why it’s critical to have flexible and innovative tools in your arsenal to make sure your hiring process caters to all of the styles in your workplace. To refresh your memory, we’ve included the description of each hiring style below. Each description is followed by a couple of resources you might enjoy – so you can be sure each style is being reflected in your hiring process! Nothing ever gets past you! You want to learn all that you can about someone – whether it’s a world leader or your next hire. Logical reasoning is the key to your success, and you want hard data to back-up any decisions. Your coworkers are always impressed by the fancy tech gadgets you have – but you just like that the new apps can make you more efficient. In fact, you are a champion for integrating your tech stack, and hope to one day have only one system login (instead of seven). Unlike some of your colleagues, you aren’t the type to simply trust your gut when hiring. No candidate comes in for an interview with you without a careful vetting process –and sometimes an early reference check. After all, the gut lies, but data never does. At SkillSurvey we can help you make more informed hiring decisions so you can find the right person for every role. With our data-driven candidate reports, you’ll get access to things like reference feedback on soft skills and data that’s been proven to predict post-hire success. Plus, by incorporating an online reference checking solution into your hiring process you can reduce first-year turnover for cause by 35%. See how we can help you and your team hire smarter! Like any good conductor, you are the glue that keeps your department organized. Colleagues love that you are never late to a meeting and are sure to keep the best notes. You care a lot about having an efficient process in place at all times. When hiring, you like to create a plan and stick to it. It frustrates you to have to do duplicate work, so it’s important that steps are automated and easily repeatable. It’s also important to make sure that your organization is staying compliant, and that everyone from HR to hiring managers are asking the same questions of all your candidates. You also are the one who wrote the laminated instructions on how to work the coffee pot, but don’t worry, we won’t tell anyone. Streamline and speed up your hiring with a 92% faster reference checking process that supports EEOC and OFCCP compliance. Select from hundreds of job-specific surveys, packed with questions about the soft skills that lead to success, or design your own survey questions. With SkillSurvey you can check references in a few minutes and get feedback on your candidates in just a day or two. Watch a short video to see how it works! You are the type of person that can make anyone feel like you have known them forever. While some of your colleagues grumble when they have to hire, you are excited about the opportunity to expand your network. You have your finger on the pulse of your company culture and work hard to find and hire candidates that will fit and champion those values. You want anyone that comes on board to feel as though they are being developed to succeed. Most refer to you as the therapist or guru of the office, but you genuinely care about your coworkers and bringing on the best new team members that you can. You also really love to give office tours since you are one of the few people in your department who knows everyone’s name. First stop is always your desk, so you can show off that framed photo of your pet! With hundreds of job-specific surveys to choose from you’ll be able to gain valuable insights into your candidates’ soft skills from their former or current managers, co-workers or direct reports. Things like: is your candidate a team-player, or are they able to work well under pressure? Gain access to detailed reports that provide behavioral-based interview questions so you can to get to know your candidate better. See how Cooper’s Hawk Winery and Restaurant uses SkillSurvey to help them bring on-board employees with not only the right skills and experience, but also those who are aligned to their core values. You are always willing to try something new – whether it’s a new restaurant downtown or a nontraditional hire. You always have your eye on the big picture and aren’t afraid to challenge the status quo if you think that change will drive your organization to success. While some might accuse you of being a little disorganized, you know that freethinking allows your creativity to take flight. Unlike some of your team, you are always looking for a new advantage, whether that’s championing innovative software or interviewing out-of-the-box candidates. You don’t fear failure, because you know every experience is a learning opportunity, and your organization won’t grow unless you flip the perspective on some of your more tired processes, including your hiring process. It’s getting harder and harder to find great talent, but trailblazers are up to the challenge! Our solution offers the ability to text or email candidates and their references, making it simple for them to respond any time, any place, and our solution provides Level “AA” conformance with W3C accessibility standards. Plus, with SkillSurvey Source® you’ll be able to quickly build a talent pipeline of highly qualified candidates and our built-in options for recruitment marketing ensure you’ll stay ahead of the competition. Discover how easy sourcing candidates can be with SkillSurvey Source! We were pleased to be selected as a speaker at this year’s conference. During the session we debunked a few of the most common misconceptions and myths about reference checking. If you were unable to make the session, we’ll be hosting it again as a webinar with SHRM. Join us on Wednesday, April 24th at 2PM Eastern and discover how advances in technology, the legal system, and behavioral science have revolutionized the reference checking process. Attendees will be eligible to receive SHRM HR credit. Register now.